Blast stains away safely and effectively with PiPPER STANDARD natural pre-wash stain remover. Using patented PiPPER Pineapple Power and extracts from corn and coconut, this stain remover dissolves and eliminates tough stains while guarding colours and protecting fabric. It is effective on mud, blood, ink, grass, food stains, juice and wine stains, sweat, as well as other tricky stains such as sunblock. Spray directly onto the stained clothing and let rest for 10-15 minutes before washing normally. 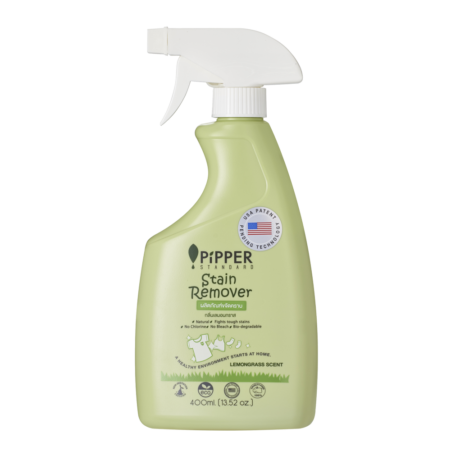 PiPPER STANDARD stain remover is non-irritation certified by Dermscan Asia, is free of known allergens and is certified to biodegrade more than 90% in one month. PiPPER STANDARD stain remover can be also used on kitchen surfaces and washable upholstery by applying directly to the stained surface and wiping with a clean cloth. Laundry: Spray directly onto stains and rub into fabric. For best results, let sit for 5-10 minutes prior to washing. Kitchen/Bathroom: Spray on soiled area and wipe clean. Rinse well. Allow longer standing time for tougher stains. Upholstery: Use only on water washable upholstery. Spray on a clean white towel and use towel to blot out stains. Rinse well with a clean damp towel. Ingredients: Fermented fruit fluid, deionised water, sodium lauryl sulfate (plant-based), alkyl polyglycoside, sodium citrate, ethanol, sodium polyaspartate, lactic acid, natural essential oil and natural preservative.